AA6E Station Log: Morse Motivation! I've been amiss not contributing to the blogosphere for some time -- busy with some writing assignments. 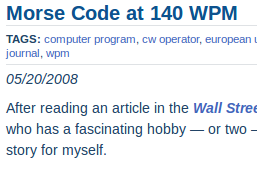 We won't all achieve 140 wpm or anything like it, but I, for one, have been stuck on a plateau around 20 wpm for many years. A while back I was inspired by a FISTS article IIRC about the guy who made the simple resolution to have at least one Morse QSO every day. It seems like such an easy thing -- but he had been doing it for many many years. I don't know what goal I should set, but I do need one.